Culminating in an evening filled with beloved favorites and upcoming Broadway shows, Elsie Fest captured some of the best talent of stage and screen on October 7, 2018. Broadway enthusiasts need to attend this event next year, to not only sing along to their favorite Broadway hits, but to also get a sneak peak of new Broadway shows. 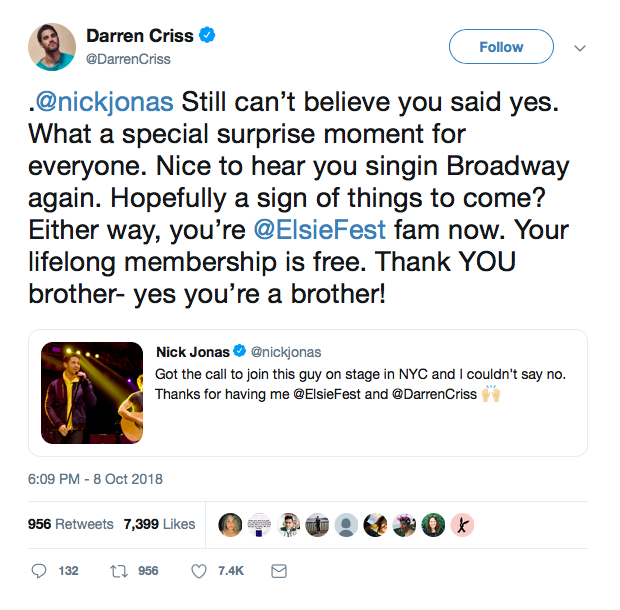 This year, new Broadway shows such as “The Prom” and “Be More Chill,” were introduced to Broadway fans at the one night event produced by Darren Criss, Ricky Rollins, and Jordan Roth. “The last time I attended was when it was held at Coney Island. Central Park has a much better atmosphere and it is much prettier,” said Lexi Smith, a freshman at the King’s college. All copyright to Elsie Fest. This was the official. poster last year. “That one (‘Dance with You’) was interesting. Not too sure about it,” said Carly Cott another attendee of Elsie Fest after watching the performance. “Be More Chill,” coming to Broadway in early 2019, amused the audience with the viral song, “Michael in the Bathroom.” George Salazar performed the comedic song while the entire audience laughed and sang along. Most recently known for his role as Kevin Keller in the CW television show “Riverdale,” Casey Cott performed two compositions of songs from “The Greatest Showman" to the audience’s delight. All copyright to Darren Criss. The crowed roared as Corey Cott, Casey’s brother, who performed as Jack Kelly in “Newsies” and as Donny Novitski in “Bandstand,” introduced Casey. The last surprise of the night came when Nick Jonas, not featured on the lineup, graced the stage. He sang “Brotherhood of Man” with Darren Criss. The audience shrieked as Jonas walked on to the stage. Whether or not Jonas appears on Broadway again, his surprise performance was well taken by the audience. A great ending to a night of musical talent.